'The PFM counting systems provide us with data on visitor numbers of Leidsche Rijn Centrum. This data is also available to our retailers, which enables them to do better. This leads to a higher value of our real estate, a win-win situation’. a.s.r vastgoed projecten is 100% daughter of a.s.r. Nederland. With a multidisciplinary team they focus on the professional and careful development of real estate projects and the sale of land positions in the development portfolio of a.s.r. Nederland. 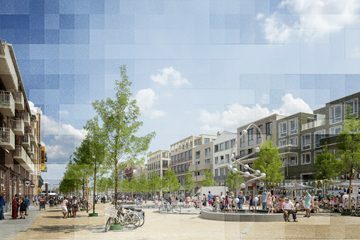 With the development of the project 'Leidsche Rijn Centrum', a.s.r vastgoed projecten has always had the ambition to not only create the most beautiful but also the most innovative shopping center. In the initial phase it was not clear how they would do this what. They therefore started looking for parties with a proven track record and a great focus on innovation. PFM has proven herself in previous projects of a.s.r. vastgoed projecten in the are of ​​customer counting systems and WiFi network installation. As a result Rogier Hendriks, Commercial Director a.s.r. vastgoed projecten, contacted PFM Footfall Intelligence. After the first meeting with Bart Schmitz, CEO PFM Footfall Intelligence, it was clear both parties shared the same vision, which was the perfect start to a great partnership. In the first phase, PFM was asked to install customer counting systems on retailer door level. An additional request was to install a center-wide WiFi network. On the initiative of PFM, the idea was put forward to install a central backbone (with 2.5 kilometers of fiber optic cable and thirteen junction boxes), to which various systems (such as the sound system) could be connected. An innovative idea, perfectly fitting within the vision of a.s.r. vastgoed projecten. a.s.r. vastgoed projecten values the cooperation with PFM. There is a lot of appreciation for the very professional way in which all work has been realized. In addition, the data supplied by PFM is of great importance to a.s.r. vastgoed projecten. With data on visitor numbers and passenger flows, there is a clear picture on which parts of the centre are very busy or less crowded, it provides insight into the success of certain marketing activities, helps with the use of security during events etc. With Leidsche Rijn Centre a beautiful shopping centre has been created, fully focused on the wishes of the customer and with a clear focus on the future. Read more here: a.s.r. real estate projects and / or Leidsche Rijn Centre.